gabicus-rex.com Blog » Blog Archive » New Super Mario Bros. The beauty of the Nintendo DS system (as well as the Sony PSP) is that you can turn shut down the system without turning off the game. 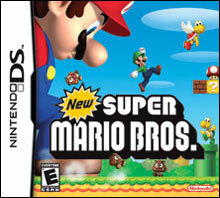 This makes the New Super Mario Bros. a great game to play. The graphics are tuned up for the newer system but the gameplay is pretty much the same NES setup. In throwing in a series of mini-games to keep you entertained beyond the regular platform leaping and secrets chasing you have quite a bit of replayability here. My son enjoys this game immensely. He especially enjoys the mini-games. Regular gameplay provides a moment for either my wife or myself to play a few levels while our son watches cradled in our arms. The best part is if we have less that exceptional play he’s still entertained, and that’s all that matters.